When you hear the word “canal”, where does your mind take you? My mind is immediately brought to the State of New York in the United States of America; to a waterway called the Erie Canal. The images in my mind have long been pre-conditioned by an old song from 1905; a song which I learned in my childhood years of singing American folk songs. Let me share a bit of those lyrics. For those who know this song, the melody will flow freely back to enhance their full recall of when and where they had sung this simple song in years long gone. As with many folk songs, once heard, the tunes remain forever in the mind’s ear; building images for the mind’s eye to share once more. In the 1780s, the State of New York had begun debating the construction of a canal system. At the time, inland goods were transported by pack-animals. This was a very costly system of transportation. Luckily for New York, the state had a number of politicians who could envision the great economic and social benefits of transporting goods by a waterway system. By 1808, enough support was rallied to initiate a survey of the practicalities involved in building such a massive transportation system. Nine years later, construction began on what would become the 584 km east-west canal; starting where Albany meets the Hudson River and ending where Buffalo meets Lake Erie. In 1825, the canal was complete; numbering 34 locks and bridging elevation differences of 172 m along the route. The costs for transportation of goods dropped by 95%. An amazing feat of engineering; one which is known in the World of Man, yet, also one of which many of today have never heard. 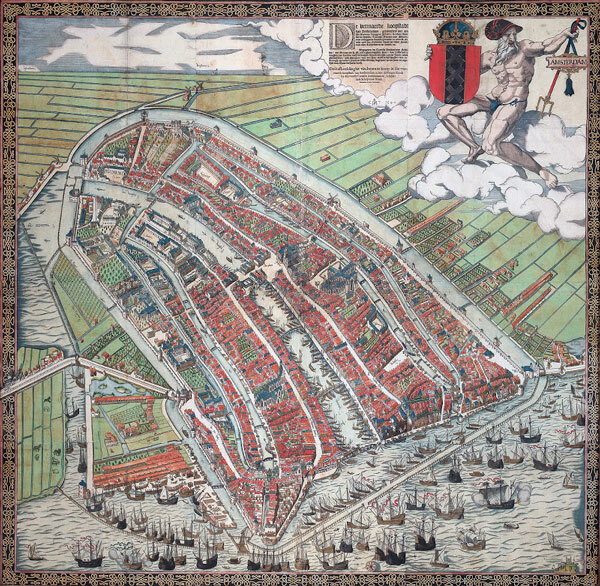 The Dutch had several reasons for developing their canals. 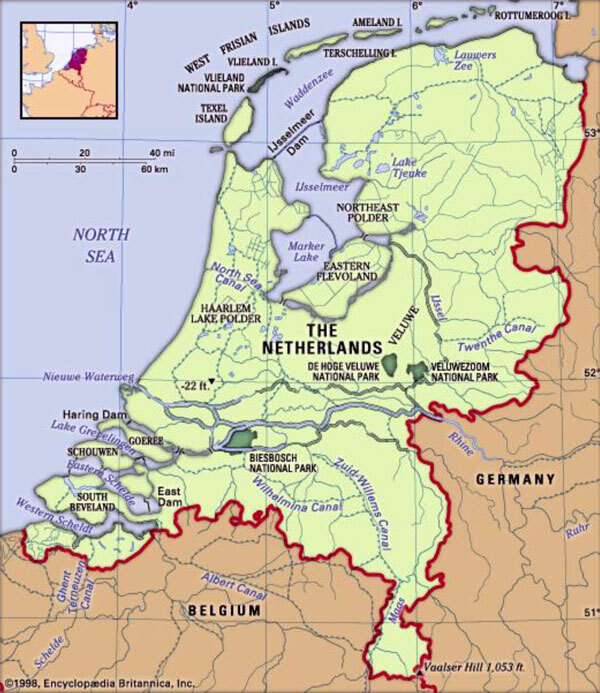 Initially, the main incentive was the transportation of goods within the Lowlands which would eventually comprise the country of the Netherlands, and connecting water trade routes with their closest neighbors. In contrast to the State of New York, which was concerned with transporting goods from one end of the state to the other in a fairly straight trajectory of 584 km, the Dutch had more use for a network of canals than one long canal. The Netherlands is a small country with shorter distances to bridge when traveling by highway: Groningen to Amsterdam is 188.2 km, Amsterdam to Maastricht is 214.3 km, and Groningen to The Hague is 236.2 km. These are, of course, modern highway routes and not water routes. The large canals were relatively short; yet, the smaller canal systems were life arteries connecting cities and villages to the major waterways of the country. City planners found canals an ideal construction for meeting the needs of the city; allowing for transportation of goods, expansion of city borders, and defense, as well as solving their drainage and sewage issues. There were even “canal cities” being literally raised from the ground. The canals were dug and the ground which was dug up went to use in the raising of the level of the streets along the canals. The merchants then built their homes upon these raised grounds. There are three categories of waterways for navigation to be considered with canals: natural rivers, canalized rivers, and artificial canals. Each category is a unique construction with particular concerns to be met when using the waterways for navigation. “Natural Rivers” are especially subject to the effects of seasons. Things like frost, drought, and floods can cause movements of the channels and the formation of shoals. The keepers of these rivers need to control natural hazards as much as possible. It is advantageous to keep the river flowing on its predetermined course. This means that river banks and beds need to be stabilized. Side channels must be eliminated and major bends need to be eased. The cross section following the natural valley of the river requires uniformity. “Canalized Rivers” are constructed of locks. These provide a series of steps; with the length of the steps depending on the gradient of the valley and on the rise of each lock. These locks are used for the passing of vessels and for the passing of excess water, weirs and sluices are required. “Artificial Canals” are capable of running an “unnatural” course. They can run through hills and watersheds as well as crossing valleys and streams. The banks of artificial canals are susceptible to erosion and seepage. Protective measures need to be taken to assure the level of quality necessary for navigation. A great advantage of artificial canals is that their routes can be planned for efficiency. However, with greater ships or heavier traffic, storage reservoirs or pumps are needed to provide water for the locks and to compensate for evaporation losses. The comparison to Europe made above was with the canal developments from the Yuan Dynasty. Chinese history, on any subject, is best placed on a timeline of dynasties. Below, I give a very short paraphrasing of Sharon Drummond’s listing of the development of the Grand Canal per relevant dynasties; followed by her words of introduction to the Grand Canal. Zhou Dynasty: 486 BCE: Began building the Grand Canal at the request of King Fuchai of Wu. Sui Dynasty: 584 CE: Canals linked into a Unified System. Sui Dynasty: 604-609 CE: Grand Canal completed in length from North to South, grain shipped from south to troops in north. Northern Song Dynasty: 984 CE: Invention of the Double-Pound Lock. 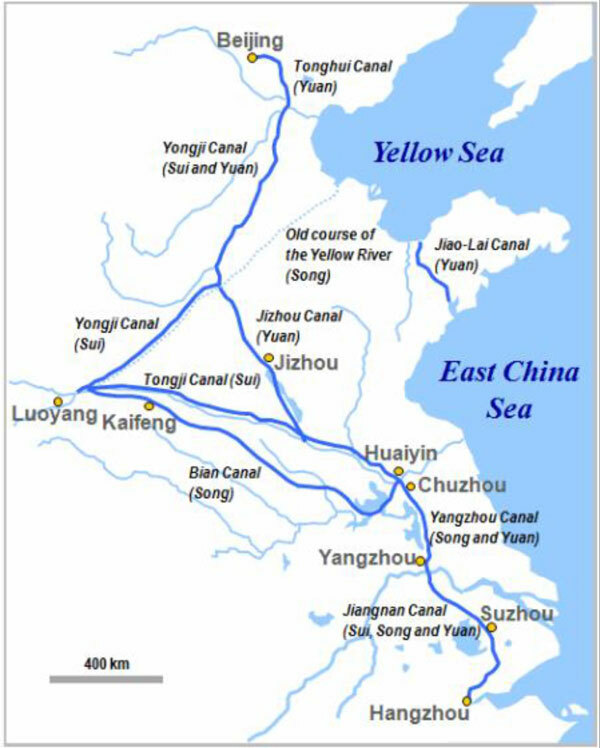 Yuan Dynasty: 1280s CE: Grand Canal unified inland navigation network of more than 2,000 km of artificial waterways linking 5 river basins. Ming Dynasty: 1411-1415 CE: Grand Canal renovated. As often is the case when researching and writing about Chinese history, different sources give slightly different dates. This is also true for statistics concerning the Grand Canal. Everyone seems to be in agreement that the Grand Canal is the longest in the world and was mostly dug by hand; yet the given length of the canal is presented to be between 1,107 – 1,801 km. The mentions of the exact year of when the canal system began also varies; 540 – 486 BCE. 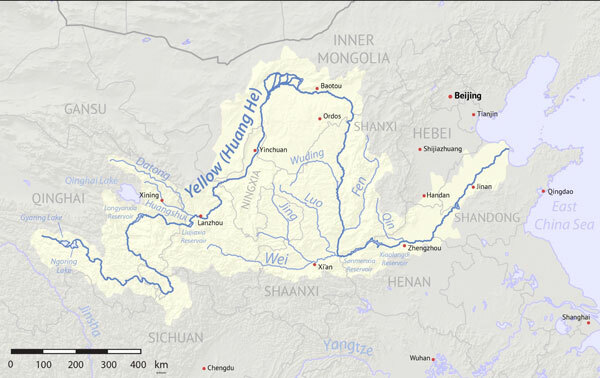 We know that the four great rivers are joined together by the Grand Canal: Yellow River, Yangtze River, Huai River, Qiantang River; although the names given are at times as diverse as the statistics. Educators tell us that the water levels in the Grand Canal have always been traditionally maintained by the use of stone gates. This system of gating allows water to enter or leave the canals when deemed necessary to prevent flooding. Gates are then opened to divert water into lakes. Madeleine Zelin is one such educator, working for Columbia University’s Asia for Educators program. In her course material she writes of the Ming and Qing eras to describe and explain the use of the Grand Canal over the more recent past. “The Grand Canal was a major conduit for grain, salt, and other important commodities. Any taxes that were paid in kind were paid in grain, which was shipped along the Grand Canal. Thus, control of the Grand Canal was of critical importance to the government. 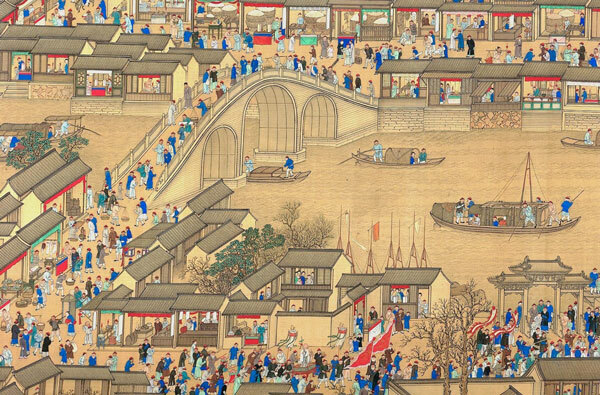 To a certain extent, the state itself facilitated the movement of goods to market by locating Beijing, its capital, far to the north, away from the rich and prosperous rice growing areas of Southern China. This resulted in a natural market for the demand of goods in the North, if for no other reason than to feed the imperial household and court. This was one of the reasons why it was so important to keep the Grand Canal working.” Another reason was that the Caoyu system financed the upkeep of the canal. This system gave the Imperial government a monopoly on the transportation of grain and any strategic raw materials. The Caoyu system assured a continued supply of taxes, food for the populace and the troops, and gave stability to the land; all through the means of maintaining the Grand Canal. The Grand Canal also contributed to the infrastructure of China; with the building of dikes, weirs, bridges while at the same time increasing the sophistication of the use of materials such as stone, rammed-earth, and clay mixed with straw. Buehler gives a very cursory rendition of the Northern Expedition. He is not alone in doing so. For some reason, most sources follow this example of presenting the most barest of facts about this military campaign; a campaign which had lasted just short of two whole years. Two years is a long time for those on a military campaign and two years is a very long time for those who are on the receiving end of the military actions. Also to be considered is that the Northern Expedition was not the only Taiping military operation being carried out during this period. The Taiping had three major armies. They had one to defend their new Heavenly Kingdom capital, Tianguo. They had a second which was given the task of retaking and holding the Yangtze River Valley. And, they had a third joint force composed of both the Northern Expedition and the Western Expedition. This third joint force was split into a two directional force to encircle Beijing; one army approaching directly and the second army encircling the west and northern areas of China, with the intention of meeting up together in Sichuan after the capture of Beijing. What most sources fail to mention is that the Taiping had many sailing vessels for moving troops. The Qing had virtually no navy at the time. The Taiping were accustomed to sailing the Yangtze in order to avoid Qing blokkades on land. 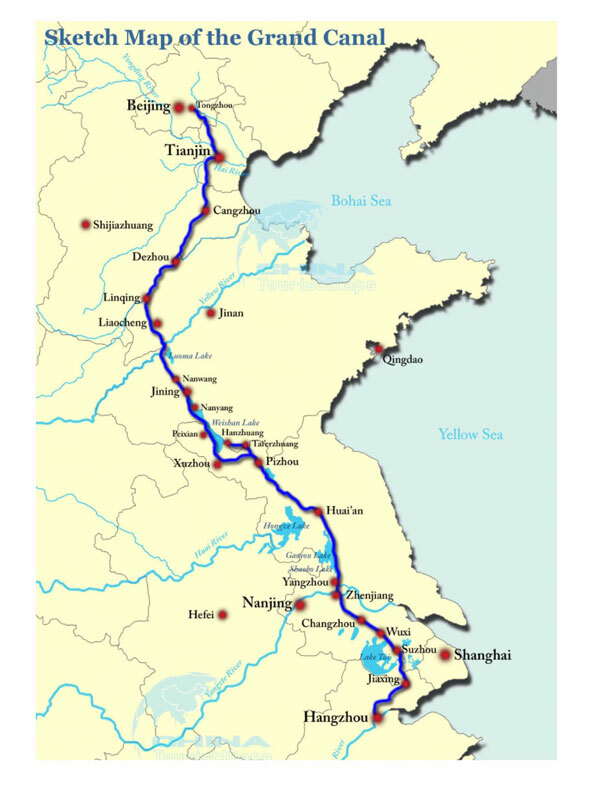 The Northern Expedition would begin their journey on the waterways of Southern China. 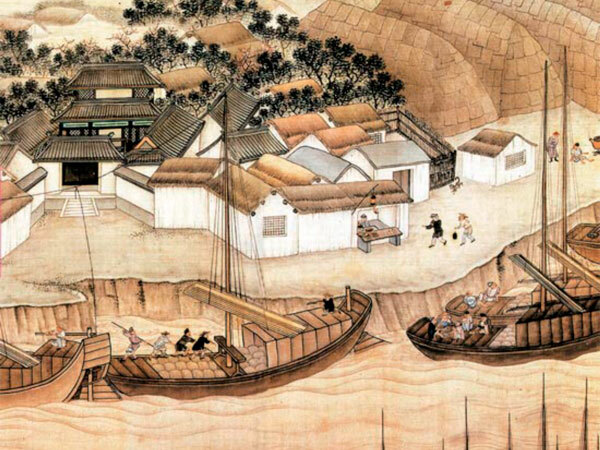 The Taiping had boats anchored on the river between Yangzhou and Zhejiang. The commanders of the Northern Expedition were all given titles of Marquis. Li Kaifang: the Marquis of Barbarian Submission. Lin Fengxiang: the Marquis of Barbarian Elimination. Ji Wenyuan: the Marquis of Barbarian Pacification. The barbarians referred to were those of the Manchu regime in Beijing. “The boats moving east from Nanjing, together with those awaiting them en route, reached a total of roughly a thousand, and onto them poured the Taiping northern expeditionary army in Yangzhou. They then sailed to the west bank toward Nanjing. 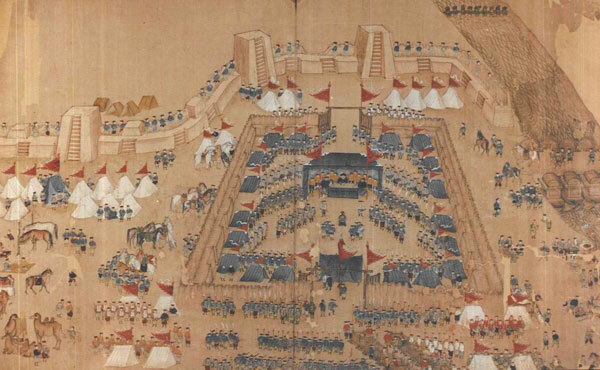 Some of them entered a waterway to a place called Luhe, while certain armies landed at Pukou, across the shore from Nanjing, and proceeded to march to the northwest.”- [Shunshin Chin]. This meant that the commanders had chosen for a roundabout route to reaching Beijing; whereas, the most direct route was due north from Yangzhou. The reason the Taiping were taking this more lengthy alternate route was because they had information saying there was a large Qing army moving south in their direction. Unbeknownst to the Northern Expedition, their campaign was beginning most unfortunately. Little did they know that the information about the Qing, was planted into the heads of Taiping spies, by order of a very clever man. “In fact, Jiangsu Provincial Surveillance Commissioner Zha Wengjing, who oversaw the construction work on the Yellow River dikes at Jiangpu, had passed on this information intentionally. The Taipings did have excellent military spies who intentionally sought out the nature of conditions in the north, yet they were completely taken in by Zha Wenjing’s artificial ploy, which compelled them to take the circuitous route toward the capital….In fact, the idea of a Large Qing Army moving south was a complete hoax.” – [Shunshin Chin]. Zha had sent secret orders to the farming families of Chizhou and Xuzhou, telling them to quickly store up military provisions. The more secretly they went about their actions, the more the Taiping spies believed that the Qing Army was truly on its way south. Forcing the Taiping to take the alternate route resulted in an exhausted Northern Expeditionary Army with depleted ammunitions. In assessment of the Northern Expedition, the failure of the Taiping can be attributed to critical tactical errors. It was a grave mistake of the Taiping to besiege Huaiqing for two months. After abandoning the siege, the Taiping marched to Tianjin instead of going directly to Beijing. If they had immediately proceeded to Beijing and attacked, then Beijing would have fallen. Instead, Beijing was allowed to prepare its army and to regroup for a successful counterattack. The mitigating circumstances which the Northern Expedition had faced were; severe weather, shortage of provisions, and poor strategy by its commanders. The Taiping Northern Expedition went down in the annals of history as being a complete and utter failure on the part of the Taiping. Instead of using their strengths on the waterways of Southern China, the Taiping crossed over into the unpredictable and unfamiliar waters of the North. Poor judgement and an impatience driven by greed motivated the Taiping to act hastily and the Northern Expedition met an early grave, drowned in the waters of the Northern Grand Canal. The Qing maintained control of Beijing and the historic Grand Canal. The main body of the Taiping Heavenly Kingdom would continue to exist under siege in Nanjing for another nine years before the Qing would finally remove their kingdom from the World of Man forever.